Daniel Bringolf enters the final day of the Federal Amateur in Canberra with a four stroke lead over Chris Brown as he goes in search of his second major amateur title. Bringolf fired rounds of 69-67 to be at 8-under-par, with Brown carding rounds of 71-69 to be at 4-under-par. 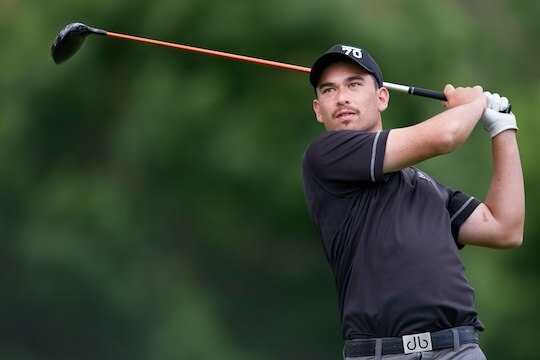 Five strokes behind Bringolf in a tie for 3rd position at 3-under-par is Dimi Papadatos and Japan’s Kenta Konishi. Bringolf is no stranger to leading main amateur events, having won the 2011 Malaysian Open Amateur. 2012 has also been an impressive year that has included a quarter-final appearance at the Australian Amateur and a top-64 at the British Amateur in June. “I have managed to minimise my mistakes and that has kept my score low,” said Bringolf, a member of the NSW Elite Squad. The Federal Amateur has again proved a stern test for our best amateurs and players have given nothing but praise to the event – a tournament Golf Australia does not recognise as a National Trial event despite the tournament’s rich history and capacity to attract top amateurs. Bringolf aside, no player has ripped apart this majestic layout and the pure Federal greens with their subtle breaks is making putting a challenge. Chris Brown, winner this year at the Golf SA Classic, is another emerging player that is capable of firing low over tomorrow’s final 36-holes. He will certainly challenge Bringolf for the title. Brown finished a creditable 4th at this year’s Riversdale Cup before winning in South Australia and recently had a top-20 finish at the Mandurah Open. Overnight leader, Rory Bourke, crashed with a second round in the mid 70′s after opening with a 67. Brady Watt, winner at last month’s Keperra Bowl and runner-up at the Western Australian Open, fired a second round 68 to move up the leaderboard to be in a four-way tie for fifth position at 2-under-par, along with Daniel McGraw, James McMillan, and Fraser MacLachlan.